pssmitty papercrafts: La Belle Vie - The Good Life! La Belle Vie - The Good Life! To make this layout I followed the Throwing a Curve pattern in the new Make It From Your Heart pattern book. The pink shape and the word Sisters were cut with the Art Philosophy cartridge. 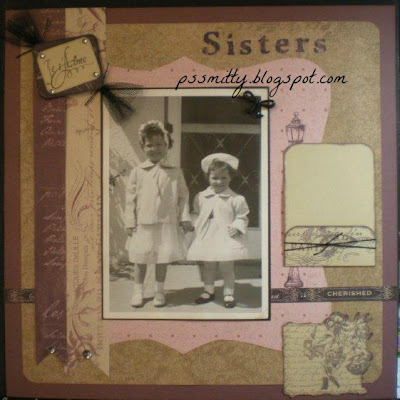 I used the La Belle Vie paper pack and also the Jardin Flair stamp set. The pocket on the right will hold a journaling tag. There is a stripe paper in the pack that is perfect for journaling on. The pocket for the tag is tied with waxy flax. The printed strip across the lower part of the layout is one of the La Belle Vie zip strips. These papers work great with black & white photos.